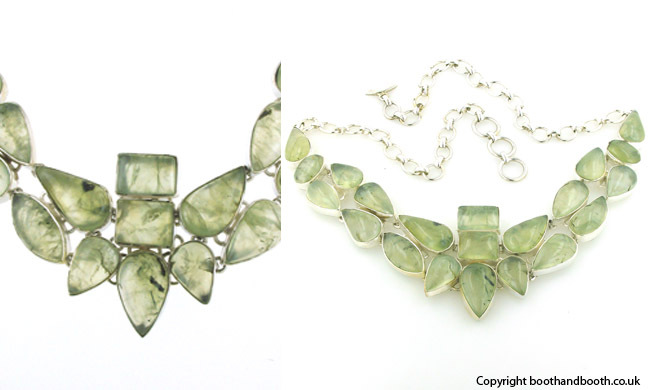 Statement prehenite necklace set in sterling silver. This magnificent necklace features 21 prehenite gemstones arranged to sit flat against your chest or around the base of the neck depending on your individual style. The stones are linked together at the back to hold them in place. The necklace is finished with a chunky plain link chain and there are 3 large extension links to allow for length adjustment. It closes with a toggle fastener. 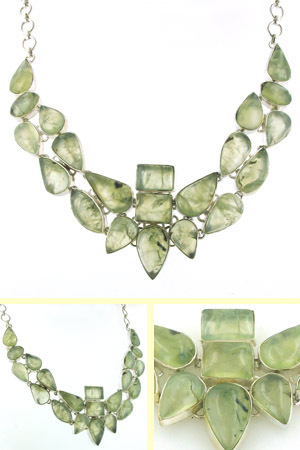 Prehenite is a light lime green coloured gemstone with areas of transparency and cloudiness. Its natural inclusions add to the character of this popular gemstone.